Just a small eBay auction this week of Black and White Press Stills (photos) and a few Colour Front Of House Stills (mini Lobby cards). 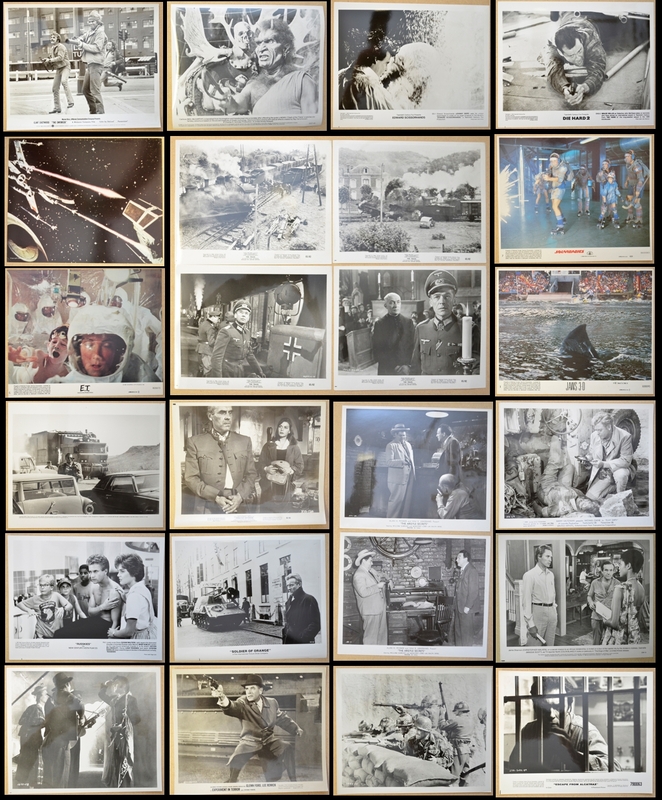 The stills are mostly collections of 1-20 photo's from each title, for example I have a collection of 20 stills for THE TRAIN (1965) starring Burt Lancaster. Also from the 1960's I have stills for EXPERIMENT IN TERROR (1962), ONLY TWO CAN PLAY (1962) starring Peter Sellers, OPERATION AMSTERDAM (1960), PLAY DIRTY (1969) Michael Cain, THE TROUBLE WITH GIRLS (1969) featuring Elvis Presley and Shirely MaClaine, plus THE YOUNG WARRIORS (1967). A couple of earlier titles including OLD YELLER (1957) starring Dorothy Maguire, ODONGO (1956) with Rhonda Fleming, and 14 stills for THE ARGYLE SECRETS (1948). From the 1970's Clint Eastwood stars as Dirty Harry in THE ENFORCER (1977) and also stars in ESCAPE FROM ALCATRAZ (1979). Also listed are GRIMM'S FAIRY TALES FOR ADULTS ONLY (1971), SOLDIER OF ORANGE (1977) and SHARK'S TREASURE (1971). 1980's Stills include 13 photos for CLASH OF THE TITANS (1981), 3 stills for RUSSKIES (1987), and 9 for THE DOGS OF WAR (1980). I also have some Colour Front Of House sets from the 80's including a full set of 8 for E.T. THE EXTRA TERRESTRIAL (1982), and a full set for SOLARBABIES (1986), plus partial sets for JAWS 3-D (1983) and ENEMY MINE (1985). Auction ends Sunday 18th November 2018.